As we travel the long and winding road to Infinity War with a look back at everything that came before it, there are some interesting bumps and dips. Marvel's Phase 2 got off to a rocky start, as we've discussed in looking back at Iron Man 3, which made a ton of money, but was something of a mixed bag and Thor: The Dark World, which wasn't good when it came out and has aged poorly. However, Steve Rogers came to the rescue with what might still be the best Marvel Cinematic Universe sequel to date. 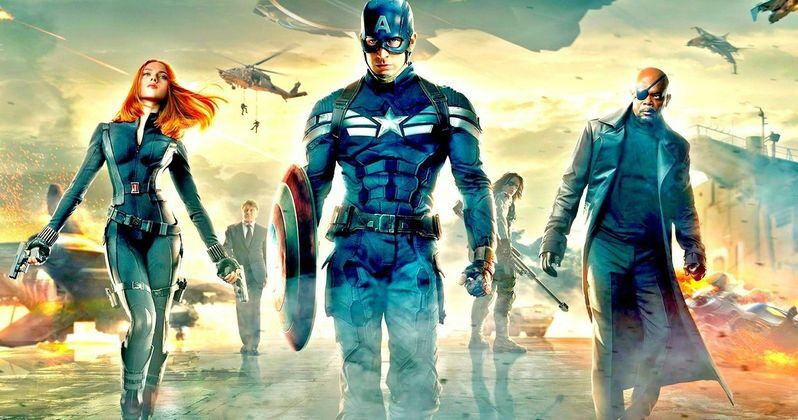 It took nine movies to get to a place where Marvel started taking some really satisfying risks with their solo movies, but it finally happened with 2014's Captain America: The Winter Soldier. This is widely regarded as one of the best MCU movies to date and it's easy to see why. This is a James Bond movie wrapped in a comic book that obliterated any and all expectations. People, both critics and fans alike, have been singing the praises of Captain America: The Winter Soldier ever since it was released. Not enough time has really passed to look back at it in broad terms. It's still great, that much is certain. But this is really where Marvel, it seems watching the movie now, started feeling confident in their ability to do some big, new, exciting things. I don't think we get movies as exciting or innovative as Thor: Ragnarok without the sequel to The First Avenger. That's a great movie in its own right, but this turns the whole Cap solo franchise into a layered, multi-headed beast, in terms of what it can be. One of the most important things that this movie did was bring directors Joe Russo and Anthony Russo into the MCU fold. Not that anyone would have thought the guys who worked a lot on shows like Community would be the right duo to bring one of the great political action thrillers in modern cinema history to life, but they were. Kevin Feige saw something in these guys and that's why they're directing Avengers: Infinity War and Avengers 4. And, as we'll discuss in the not-too-distant future, the excellent Captain America: Civil War. These dudes really know how to provide balance. I'd say it's their biggest asset as storytellers. Balancing action with drama. Balancing humor with tension. Balancing many different characters and storylines. If it needs to be balanced within the scope of a movie, they can balance it and balance it expertly. This movie feels special right from the start. That very opening shot of Chris Evans' Steve Rogers blazing by the man we now know as Falcon and saying, "On your left," just sets the tone perfectly. And while we're on the subject, Anthony Mackie really did become an asset to the MCU and that all starts here. Still possibly his best performance in the Marvel universe to date. To that point, there are a lot of outstanding performances in this movie. There's something about the way that the Russo brothers are able to get something out of actors that just makes their movies feel special within the scope of the MCU. This is where Black Widow really became a deeper character. We also really get to see Nick Fury as more than a side character for the first time. Sure, he had a lot to do in The Avengers, but that wasn't his show. He's a core player this time around. Additionally, this is where, in my mind, Steve Rogers the modern man, and not just Captain America the hero, really reveals himself to us. One of the best things about The Winter Soldier is that it really does stand on its own as a great movie, but it lays a lot of groundwork for the MCU moving forward without being heavy-handed about it. Like that incredibly cool Stephen Strange name drop. Little things like that. Again, balance. If there's something else that stands out in this movie above all other MCU movies to date, it's the fight choreography. Every fight in this movie is so intense and well-executed that it really set the bar quite high for anything that requires a close-quarters fight within the Marvel universe from this point forward. There are also just some truly tremendous action set pieces in this movie. The opening sequence on the boat sets that up from the get-go. There's also the incredible car chase with Nick Fury in Washington D.C. and, lest we forget, that unforgettable elevator sequence. The final sequence with the helicarriers is also really great, but it's definitely got that escalated, third act feel to it. That's not even really a gripe, it just doesn't feel as special as some of those other sequences do. Even things that the MCU movies typically have issues with aren't present here. Marvel movies, as we've talked about a lot in this road to Infinity War series, have a bit of a lame villain problem. In this movie, you've got more than one good bad guy to hang your hat on. Bucky Barnes coming back to haunt Steve Rogers as a deadly ghost from the past in the form of The Winter Soldier is the main event, and it's a damn fine main event. But Robert Redford, though perhaps not gifted with a ton of screen time, is incredibly effective as Alexander Pierce is a great counter to the brooding darkness of Bucky. And there's the Hydra thing, which is maybe the best "twist" in the MCU to date. That was a bold move that was executed to perfection. And Frank Grillo's Brock Rumlow is a terrific, brooding Bond-esque henchman type. The antagonists in Captain America: The Winter Soldier offer a lot to love. This is a very tough movie to poke holes in, even as far as comic book movies go. Captain America: The Winter Soldier is still the measure of what these movies can achieve on an individual basis. It's gritty, emotionally effective, thrilling and wholly entertaining. Save for Nick Fury's fake death, with fake deaths being a thread in these movies generally, this is Marvel at its finest.